Data entry is inevitable in accounting. But that tedious "heads down" work doesn't have to take up so much time. When entering a large volume of transactions, switching between your keyboard and mouse can be inefficient. It not only slows you down, but it can break your concentration and cause errors. 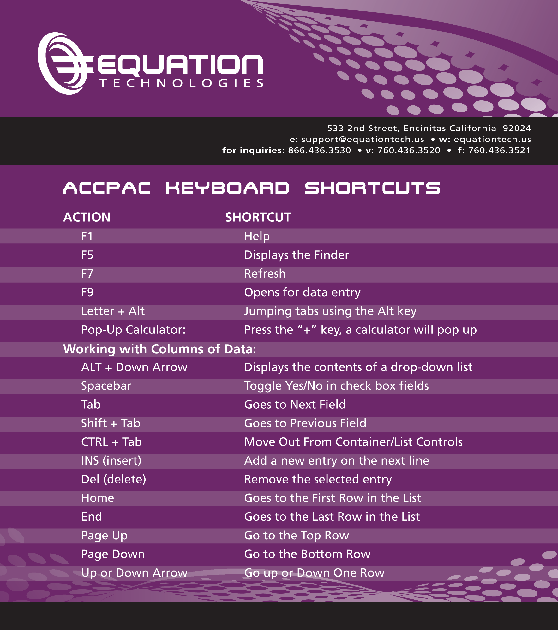 So here's a handy set of keyboard shortcuts in Sage 300 ERP (formerly Sage Accpac) that can really save time entering data, navigating screens, and processing transactions. Ctrl + Tab Move out of a grid or list to the button or field following the grid or list. These shortcuts provide a quick method of adding, deleting, or editing data in a record or form. F2 Turn on edit mode in a list or grid (press again to turn off). This post is an article that appeared in our Sage 300 ERP newsletter for 2nd Quarter - 2013.